A restaurant in South Carolina will not play National Football League games until players stop disrespecting the American flag by kneeling during the National Anthem. McCraw has lived all of his life in South Carolina, except for the four years he spent in the military. He feels that the players who kneel during the National Anthem disrespect the country he loves and the flag he served to protect. “I feel that it’s totally disrespectful to the men and women who are serving our country right now, who are laying their lives on the line for our country, for the rights that we have, that we enjoy,” McCraw told Fox Carolina. McCraw built his restaurant in 2012 and has been in business just over five years. He agrees with the sentiment behind what the NFL players are sending but disagrees with the way they are choosing to send it. Since he announced the boycott against the NFL, McCraw has seen mostly positive responses from patrons. There have been some people who disagreed with his move to turn off NFL, but McCraw believes they don’t realize that he actually supports the NFL players’ message. McCraw’s boycott of the NFL in his restaurant began after seeing a wave of NFL players kneel during the national anthem on Sunday, Sept. 24. 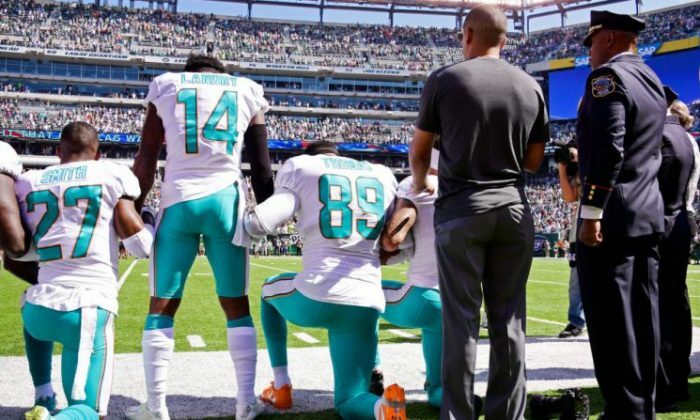 The NFL players we responding to comments made by President Donald Trump, who asked that players be fired or suspended if they kneel during the National Anthem. McCraw agreed with Trump when the president demanded respect for the flag. He also felt the players’ protest could be disseminated in a more appropriate way. Having served in the military, McCraw said he was sickened to see the disrespect conveyed by the protesting NFL players. “By taking a knee and not respecting our flag and not respecting the United States is a direct contradiction to the men and women who are serving our country,” McCraw said. “More importantly, the people who have passed away serving our country, who are now residing in Arlington cemetery, those people have given the ultimate price for the very rights that we have today: to be able to say what we want to say and do what we want to do,” he added.